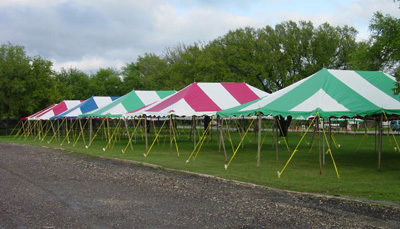 Carry on with your outdoor gathering despite the weather with Ohenry Tents. Ohenry Tent's Premier Party Tent Top provides a durable shelter from sun, rain and sleet. This top is designed to replace a 30'x50' canopy top ONLY. Please note that the tent frame is not included. This durable 15 oz "Block Out" top features 2" seatbelt webbing around the entire perimeter and is built to endure numerous set ups and take downs. It's available in solid white and also white with red, blue, green or yellow vertical stripes. A protective storage bag and 1-year manufacturer's warranty are included.